I wrote the above for the 2018 Washington State Visitor Guide. hThis past week I got up close and personal with what’s been done so far. To say I was impressed is an understatement. That’s the very good news. Two restaurants have already opened in this first phase of construction. Twigs Bistro and Martini Bar opened last September, and Wild Fin welcomed its first diners around the same time. My friends and I chose Happy Hour at Twigs because we were already familiar with Wild Fin. On my first visit (yes, I had to take a second look) to the Vancouver WA waterfrontproject the sun shone brightly causing the Columbia River sparkle. Masses of humanity and their canine companions took advantage of the newly-paved trail to get in their daily required steps. Groups of people chatted while others dined al fresco. We made a delicious choice. I treated myself to Twigs Mezza, an appetizer with grilled pita, garlic hummus, olive tapenade and tomato confit. My compadres ordered Roasted Brussels Sprouts and the Fig and Prosciutto Flatbread. Lots of oohing and ah-ing and no complaints at all. 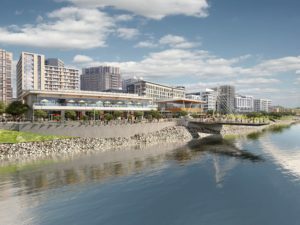 Looking forward the Vancouver WA waterfront project will encompass 3,300 homes, 32 acres of retail and restaurant space plus Hotel Indigo, a 6-floor, 138-room lodging facility set to open in 2020. The hotel (to be completed in 2019) itself will house three restaurants and a sky bar. Phase two, which includes apartments and condos, is scheduled for completion in 2020. Phase three is too far away to have an estimated finish date yet. The centerpiece of the park is the 90-foot cable-stayed pier that mimics the hull and mast of a ship, once only an idea of artist Larry Kirkland. 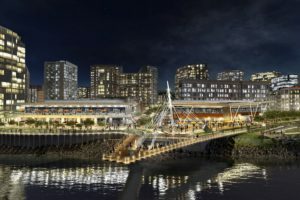 This connection to the river symbolizes Vancouver’s reconnection with its waterfront in the form of a stunning backdrop. If you’ve not visited the “other” Vancouver for a few years, you’ve got a real treat in store. This entry was posted in Art, Dog-friendly, Family Fun, hotels, Restaurants, Towns, Uncategorized and tagged Twigs, Vancouverwa project, Vancouverwa waterfront, Vancouverwa Waterfront Project, Washington State, Wildfin on April 10, 2019 by Heather Larson.